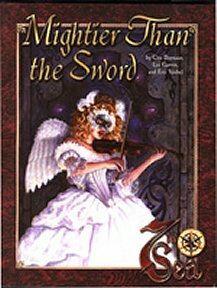 Mightier than the Sword is an adventure book containing two distinct adventures titled "The Music of the Spheres" and "The Golden Head of Korlak ur-Nagath". Publisher's blurb: "Double the adventure - same great price! In Music Of The Spheres, a lavish masquerade is thrown in honor of the Emperor of Montaigne's latest musical protege, but something goes astray, and danger awaits those who seek to put things right. In The Golden Head Of Korlak ur-Nagath, it hasn't been seen in over a thousand years. It's nine feet tall. It's made of solid gold. It may just be the most valuable artifact in all of Theah... and you know where it is."